Free shipping. Buy direct from HP. 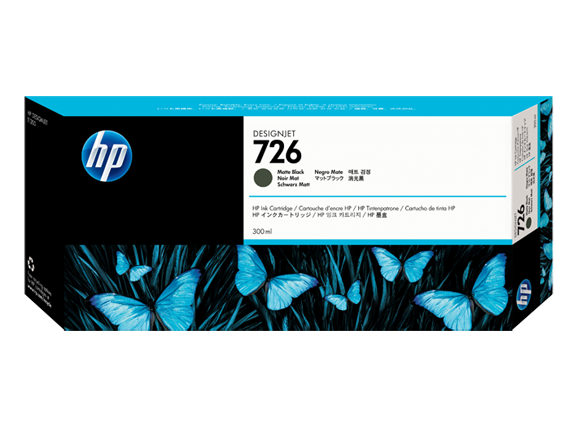 See customer reviews and comparisons for the HP 726 300-ml Matte Black DesignJet Ink Cartridge. Upgrades and savings on select products. Original HP inks produce crisp text, fine line accuracy, true neutral grays, and vivid color.Fast-drying Original HP inks enable fast print speeds and produce prints that resist smudging.Transform your everday printing with HP media innovations including new and improved bond papers with ColorPRO performance and HP Recycled Bond Paper. Ultra-pure Original HP inks—designed with the system—ensure consistent, professional results.Intelligence built into Original HP ink cartridges continuously optimizes quality and reliability.Avoid waste and rework—HP media and Original HP inks—designed to work better together.To ensure reliable, trouble-free printing, Original HP inks are rigorously tested.Avoid downtime with the legendary quality and reliability of Original HP printing supplies. Intelligence built into Original HP ink cartridges provides alerts when supplies need to be replaced.Choose from two sizes of matte black; the HP 72 130-ml ink cartridge or the HP 726 300-ml ink cartridge.It's easy to identify and install the individual ink cartridge color you need to replace.Free, convenient ink cartridge return and recycling. Visit http://www.hp.com/recycle for details. Intelligence built into Original HP ink cartridges provides alerts when supplies need to be replaced.Choose from two sizes of matte black; the HP 72 130-ml ink cartridge or the HP 726 300-ml ink cartridge.It's easy to identify and install the individual ink cartridge color you need to replace.Free, convenient ink cartridge return and recycling. Visit http://www.hp.com/recycle for details. 1 Program features and availability may vary by country. For more information, visit http://www.hp.com/go/designjet/supplies. 2 In the circa 45 countries and territories in which the HP Planet Partners program operates. Program features and availability varies. Where this program is not available, and for other nsumables not included in the program, consult the Material Safety Data Sheet (MSDS) available at http://www.hp.com/go/ecodata to determine appropriate disposal.